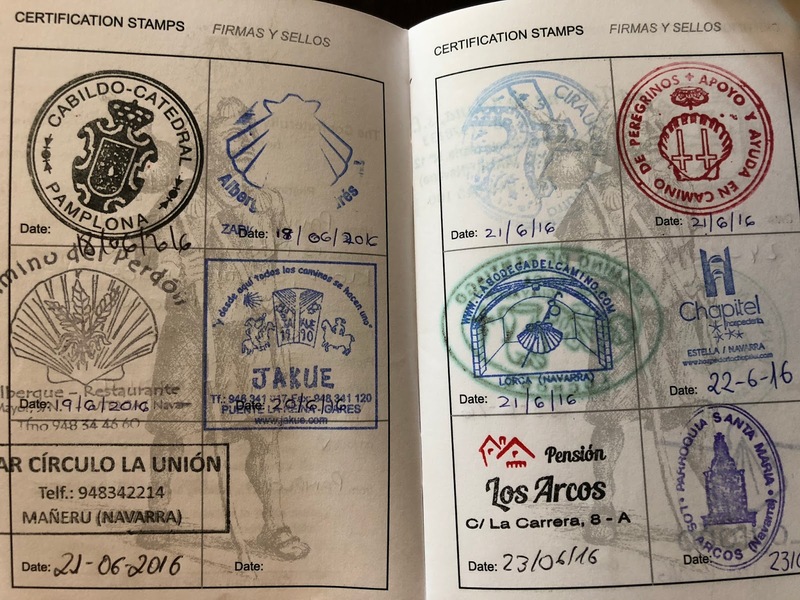 A blog about the walk my husband (Grant), daughter (Paula) and I (Gill) did, along the Camino de Santiago route, from Pamplona to Logrono in June 2016. To navigate to the pages its easiest to use the labels to the right of the screen. The Way of St. James was one of the most important Christian pilgrimages during the Middle Ages, together with those to Rome andJerusalem, and a pilgrimage route on which a plenary indulgence could be earned; other major pilgrimage routes include the Via Francigena to Rome and the pilgrimage to Jerusalem. The Way can take one of dozens of pilgrimage routes to Santiago de Compostela. Traditionally, as with most pilgrimages, the Way of Saint James began at one's home and ended at the pilgrimage site. However, a few of the routes are considered main ones. During the Middle Ages, the route was highly travelled. However, the Black Death, the Protestant Reformation, and political unrest in 16th century Europe led to its decline. By the 1980s, only a few pilgrims per year arrived in Santiago. Later, the route attracted a growing number of modern-day pilgrims from around the globe. In October 1987, the route was declared the first European Cultural Route by the Council of Europe; it was also named one of UNESCO's World Heritage Sites. 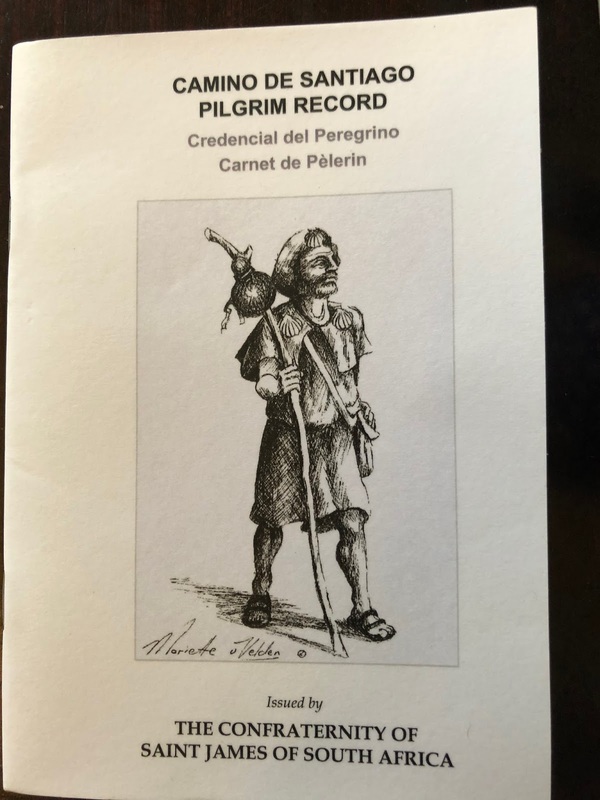 What is the Pilgrim Credencial - the Credencial, also known as a Pilgrim Record, or Pilgrim's Passport, is a little book that people walking the Camino carry with them to prove that they are pilgrims. Many albergues, catering to pilgrims walking the Camino, require the pilgrim to produce this document as proof that they are in fact pilgrims. The pilgrim will get this book stamped with sellos at churches, albergues, pubs etc along the way. These sellos serve as proof to the Pilgrims Office in Santiago that the person has indeed walked the Camino. 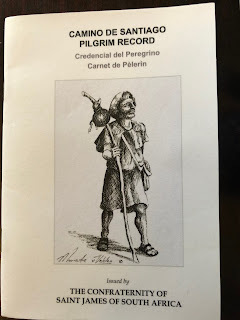 The Pilgrim Credencial can be ordered online from the local Confraternity of St James, or online Pilgrim stores, or picked up at the Cathedral in the town where you start walking. A page of my Credencial, stamped with sellos from various places. We walked a small (very small) section of the Camino. There are many Camino routes, the section we walked was on the route called the Camino Frances which is 780km long. Thousands of people walk the entire route every year. The guidebook we used was John Brierley's guide, it's the most commonly used guidebook. There are others. Some people love Brierley's guide, but there are many who don't. 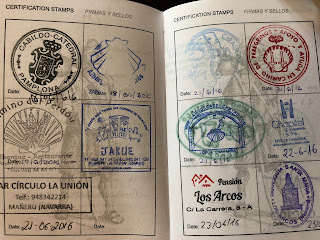 To be honest, you can get by without a guidebook if you do your research beforehand (and I suggest that you DO do your homework beforehand) - for example read blogs, spend some time on the forum, check out websites such as Camino Adventures. I'm a cautious kind of girl, so I felt happier carrying the guide, but we didn't use it very much. Brierley's guidebook has stages, we generally walked significantly shorter distances than the stages set out in the book. You can walk very short, very long, or anywhere in-between stages, it's entirely up to you. The average stage in the guidebook is roughly 25 to 30kms. If you really want to, you can book your Camino experience through a tour company. If you feel very independent you can pre-book absolutely nothing and simply arrive and walk, staying in a hostel when you feel like stopping. The age of pilgrims varies from school-kids to senior citizens. Many retired people walk the Camino as they are able to take extended amounts of leave. It takes the average person roughly 5 weeks to walk the full Camino Frances. You don't need to carry your backpack on the Camino if you don't want to, there are a couple of companies that will transport it for you. On our two longest days Paula and I had our rucksacks transported by Jacotrans for a small fee. It was a slick operation - I booked online, they emailed me luggage-tags,we attached these to our backpacks and left it at reception and when we arrived at our next destination there were our bags. You can also book by phone. Many people, particularly Catholic people,do the Camino for religious reasons, but you don't have to be religious, or Catholic, to do the Camino. We did not do the Camino for religious reasons and not a single person asked us about our beliefs, or expressed their beliefs to us. You don't need to speak Spanish to do the Camino. Learning the very basic-basics helps. I found the book Camino Lingo useful. We also used a free online course for a couple of weeks before we left. It was fun, but not vital and we never got very good at it anyway. Google Translate on our iphones was a lifesaver in restaurants. Many Spanish people working on the Camino route have at least some English and, if all else fails, sign-language works! Training... in my personal opinion you actually DO need to do at least some training before tackling even a short section of the Camino like the one we did. I had read comments by some people who were of the opinion that you could pretty much train while ON the Camino... I don't think that would have worked for us. And frankly we could have done a lot more training than we did! Perhaps it depends on which section of the Camino you do, or how fit you naturally are? The section we did had a few really challenging bits. I read a blog the week before we left (which I will admit put me into something of a flat spin) where the person expressed how shocked he was by how tough the Camino actually was and how the guidebook failed to convey this. I thought he was exaggerating. He wasn't. The Camino is not a stroll in the park. It's not rock-climbing or extreme hiking by any means, but it's not always on flat, even terrain. The uphills didn't surprise me, I had done my homework, but what surprised me was the downhills and the terrain. It seems to me that the photos you see on blogs (mine included) don't show the really challenging terrain. What happened to me was that I took photos at the point where the terrain was getting more challenging (and even then, the photos don't do it justice), but where it was REALLY tough I was too focused on getting through it to stop and take photos. Don't get me wrong, it's not like there were DAYS of tough terrain, or even hours of tough terrain... there were just some sections of, say half an hour, where the going was tough. I wouldn't let it put me off, definitely not, but I would prepare myself for it. Gear. On a limited budget, I would spend money on my socks and shoes first, then my backpack and then the rest of my gear. Certainly, for the section we did, which was fairly mountainous, I believe the right gear can make all the difference. If you do nothing else, make sure your shoes are properly worn in and that your backpack fits you properly and distributes the weight onto your hips not your shoulders. 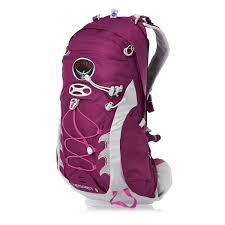 I loved my Osprey backpack. I debated whether to take hiking poles, and then I considered taking only one hiking pole.... (laughs hysterically) I would NOT have managed some of the downhill sections without my hiking poles. That being said, Grant and Paula did fine with only one hiking pole. Different strokes for different folks. We walked in wicking-type sports T-shirts and were very glad we did as we had some seriously hot weather - we didn't go for hugely expensive ones, we bought from Mr Price Sports. We used socks that had 2 layers, to help prevent blisters and they worked brilliantly (the brand we chose was 1000 mile), I would definitely use them again. 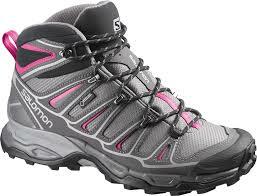 I have extremely narrow feet (like, extremely, freakishly narrow) and the Salomons are a good fit for me. My orthotics fit perfectly in them. In retrospect I should have listened to the advice I was given and gone at least a size bigger... After walking in excess of 15kms my feet began to swell and on the downhills my toes took strain. If you plan on sleeping in dorm rooms in the albergues you will need a sleeping bag (or in Summer months just a sleeping bag liner should suffice) which is not included on my packing list as we didn't sleep in dorms. Oh and on the subject of gear... don't, whatever you do, don't carry too much weight. The rule of thumb is maximum 10% of your body-weight. Honestly, truthfully, you CAN buy anything you need while on the Camino, there are shops... pharmacies.... hardware stores. If in doubt, don't pack it, leave it behind! You can cycle the Camino or even do it on horse-back. If you want to watch a movie set on the Camino there is one called "The Way" which we enjoyed. Obviously the weather can be variable, but It's worthwhile doing some research before deciding which month to walk your Camino. We chose mid to late June this time. We plan on going in September if we are ever lucky enough to do another stint on the Camino. I gather Spring can be lovely, but can also be quite wet. Would I do another walk on the Camino? Absolutely! I would do another walk in a heartbeat if finances permitted. It is a wonderful experience, unlike any other. The stress relief that comes from having to worry about nothing except the day's walk ahead of you is indescribable. The scenery. The history. The nature of the walk. The people. The facilities provided for pilgrims. The sense of safety and security on the trail (a big deal for us South Africans!) It all adds up to something so very, very special. I love it. What a wonderful account I remember this walk well, I was there in May of 2016 celebrating my 72nd birthday. I went back this year for 10 days and will go again next year to do the complete Camino Francis. I think you were very savy to go slow and really take it in congratulations and don't wait too long to go back.